Pam Schwartz and I drove to Winter Garden to experience the Martin Luther King Day parade. When we arrived, we realized Plant Street was closed off for the parade, so we parked a block East in a small park on the biking trail. When we walked back to the intersection of Dillard and Plant Street, the parade had just started. The parade was organized to celebrate and honor this great leader of the civil rights movement. This was the first time the parade was being held in downtown Winter Garden. The parade staging area was in an empty parking lot across from the Foundation Academy North Campus. Two police motorcycles were flashing their lights. Young cadets in white uniforms held a banner and stock marching rifles. The U.S. Naval Sea Cadet Corps is a national youth leadership development organization that promotes interest and skill in naval disciplines while instilling strong moral character and life skills through leadership and technical programs modeled after the Navy's professional development system. The parade was small to say the least. Maybe 20 to 30 people and a few miniature ponies were in the parade line up in the parking lot. Because of this, I knew that I didn't have enough time to sketch. Pam and I decided to walk along with the parade towards the park where the Farmer's market is usually held. We walked the parade route at the same pace as the parade. The most interesting "float" was a pick up truck with a lawn maintenance trailer behind it. A preacher shouted a sermon from the back of the pick up towards his "congregation" who sat in the trailer. I never actually heard what he was shouting. When we got to the end of the parade, at the Downtown Pavilion, we followed the sound of music to the main stage. 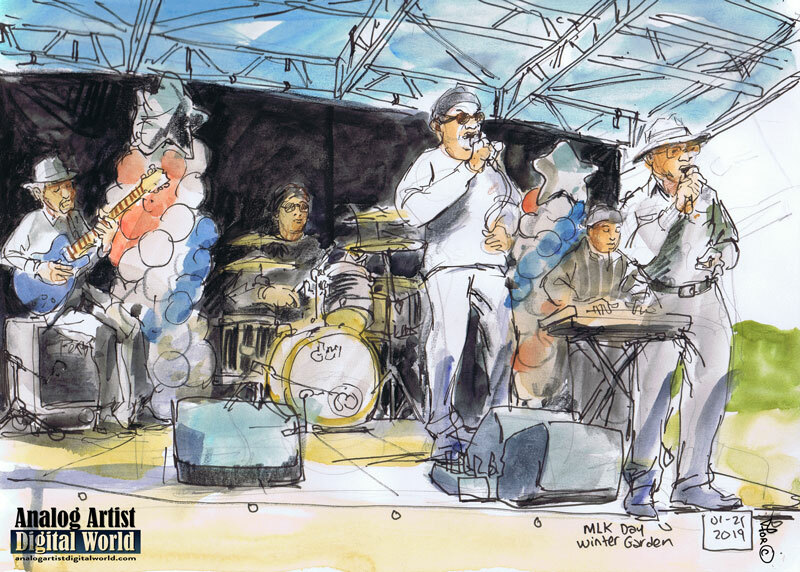 A blues band was on stage along with two red, white, and blue balloon pillars topped by large Mylar stars. One guitarist got up to the microphone at the front of the stage, and I thought he was going to sing so I started sketching him. His guitar strap broke and he sat back down to fix it. He was replaced by Willie C, who is 94 years old and knows his way around the blues. A line of kids from an art group called Art After 5 stood on stage, and each in turn got up to the mic to say what their dream for the future was. It is heart warming to hear kids innocently proclaim that they would like to see a world without racism or sexism. The sun blinded me from the sketch page and I had to wipe a tear from my eye. One of the children had a fine set of lungs, and she sang "Climb Every Mountain."